Each boating season, it happens at least once. Pleasure boats are wrecked on rocky shorelines. Lives are in jeopardy and sometimes lost, and each time, critics show up to evaluate something they know little or nothing about. Some vessels suffer damage to their underwater equipment; propellers, shafts, rudders, etc. Many boats are recovered quickly and only need a few parts replaced while others sink and require extensive work to recover. A few are declared total losses. Even though wrecked, these vessels must be recovered to avoid being a hazard to others using the waterways. They also cannot be allowed to create a scattered mess along the shoreline. Some of these recoveries entail the use of extensive equipment and specially trained personnel. Some require people with the grit to face the challenges of Mother Nature. When people are aboard vessels in peril, recoveries place lives at stake to save others. 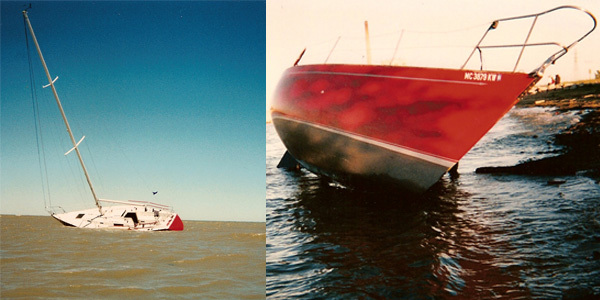 An example of a most difficult case occurred one year in Harbor Beach, Michigan while I was operating my salvage and towing business. A racing class sailboat, attempting to make port in wind tossed 6 to 8 foot seas, missed the harbor opening and hit the rocky bottom. The next few minutes must have seemed like hours to the people on board the helpless craft as she floundered at the mercy of the seas. She hit the rocks and heeled over, then slipped into a deeper area and began to float. As the captain tried desperately to bring the vessel around, she hit bottom again and began taking on water. Because it took place right in front of their station, Coast Guard personnel witnessed the entire incident. They were quick to respond and offer assistance. At one point the skipper told the rescue personnel he was floating free and heading for the opening in the breakwall. His next transmission relayed that he had hit very hard and water was rushing into the bilge and coming up over the lower deck. The Coast Guard advised the skipper to ready an anchor. He responded he had an anchor but no anchor line. The skipper then requested that the Coast Guard try to pull his sailboat out of danger. The Coast Guard had responded in a 25-foot inflatable craft but the coxswain knew he could not pull the 17,000-pound sailboat in 6 to 8 foot seas. He also knew if he did, with water now well over the lower deck, the boat could sink in deeper water and endanger the lives of those aboard. The decision the coxswain made was to save lives. He passed the longest line he had aboard to the skipper and told him to fasten it to his anchor and deploy it. After the anchor was dropped, the Coast Guard removed two crewmembers from the boat and took them safely ashore. Just as the people left the vessel, the water had reached the cabin top and the boat came to rest on the rocky bottom. Darkness set in as plans were being made for salvage operations. The people rescued from the sailboat were in the safety of the Coast Guard Station, and although shaken from their experience, unharmed. That evening while the salvage company put together a crew and loaded equipment for recovery attempts at daybreak, the fierce wind that had driven the sail vessel ashore continued. By morning the sailboat had washed into three foot of water and lay on her port side still pounding in the seas as the wind began to subside. The owner had not been aboard when the incident occurred so the first four hours of the recovery operation were spent planning the removal of the boat while waiting for him to reach the scene and authorize the needed service. The salvage job would be extremely difficult and hazardous. As the crew assembled and heavy equipment arrived, hundreds of people stood and watched. Many stood right in the way of the workers. Several large boulders plus a city water intake pipe created obstacles. The six to seven thousand pound keel was pulling away from the hull on one end, and jammed into the hull at the other so it could not be totally separated. While I discussed plans for removal of the wrecked boat with DNR officers and a city police officer, people telling us they had witnessed the entire incident continually interrupted us. Each wished to place blame; on the Coast Guard, dock personnel or Corp of Engineers. None wished to believe the operator was at fault. One man, after rudely interrupting, said his friends were on that boat and the Coast Guard should have pulled them to safety. I took a few minutes to inquire of the man if he had tried in any way to assist them. I then suggested to him that thanks to the Coast Guard his friends were still alive. To place blame on the Coast Guard for a mistake on the skipper’s part was unfair, especially after they had saved lives. To blame the dock master was absurd. Their job is to pump fuel, assign dockage and assist in mooring; they should not and cannot be expected to know the ability of a master to handle his vessel. When the recovery operation was completed and the vessel was loaded on a flatbed for transport, evidence was discovered that helped explain how the incident occurred. A nylon line, fixed to the vessel, had gone over the side and wrapped tightly around the folding propeller and shaft. Another factor that contributed to the severity of the event was there was not an anchor line, with chain fixed to the anchor, ready to deploy. Murphy’s Law, “If anything can go wrong it will” should always be foremost in a captain’s mind. It was sad to see a sailboat that was among the best in its class totaled in an accident such as this but the blame, if any, lies aboard the vessel and in the hands of the Master in charge. Before the harrowing event began, he should have checked his charts and determined if he could enter the harbor entrance he had chosen. If unsure, he should have gone on to the entrance lighted by a lighthouse and buoyed to the dock. A final sad commentary regarding this event was that the Coast Guard vessel was vandalized during the night after the rescue. Had another vessel needed their assistance, they probably would not have been able to respond. It is too bad that one of the hundreds of people who witnessed the Coast Guard’s earlier activity, and criticized it, did not observe the vandalism.